“Central Presbyterian Church 1870 – 2001 A Brief History” was written by the late Garner R. Morgan at the request of the CPC pastor at that time. The following information is attributable to that document. Copies of the original History are available at the church office. Central has some of its roots in the New Providence Presbyterian Church. Back in the day (1737) when travel was not so easy, the five mile journey from Summit to New Providence was long for families taking their children to Sunday School. Finally, in 1867 a group of families established “The Franklin Chapel Association” in a building near Springfield and Oakley Avenues. At the same time another group in the Turkey Hill area began a Sunday School and held prayer meetings above Littell’s General Store near the newly constructed Delaware, Lackawanna & Western railroad station. 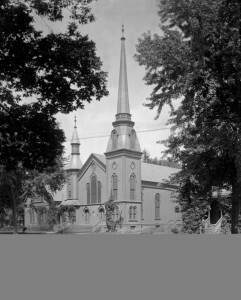 In 1870, with the support of the New Providence church and the approval of Newark Presbytery, these two groups of worshippers founded Central Presbyterian Church on May 29, 1870, and promptly elected ruling elders, trustees and deacons and began a search for a pastor. The first pastor, Rev. James DeHart Bruen, was installed on May 11, 1871 at an annual salary of $1,000.00. Worship services continued in the room above Littell’s General Store while a building campaign was underway. The cornerstone for a sanctuary was laid on Nov. 3, 1871, with completion in mid-1872. Most of the church’s income for the first twenty-three years came from seat rentals: each pew was assigned a value based on its nearness to the pulpit, with each member being assessed twenty percent of the value of the selected pew. As the new century was ushered in, the church’s role as defined by the Session to be the arbiter of the morality, propriety or even appropriateness of its members’ everyday activities came to an end, as did public rebuke or suspension of communion privileges or even excommunication for any infraction of church rules. With the new century, Session began to interpret its responsibility for spiritual leadership in broader, corporate terms, and individuals were allowed to be accountable to God and to his own conscience. Also with the new century, the congregation had grown and plans were underway for a new, larger sanctuary. The cornerstone for the building we know as Central was laid on May 29, 1906, just thirty-seven years to the day after the founding of Central Presbyterian Church! Amazingly, it took just over a year to build this grand structure, and it was dedicated in services on July 14, 1907 at a cost of $75,000.00. The congregation and Summit itself continued to grow. In June 1923, the cornerstone for the current Auditorium Building, known as the Parish House, was laid and the building was completed the following year. More than half the area of Summit’s six square miles is within one mile of Central! Space in the existing Sanctuary and Parish House was crowded, so in 1947, thoughts began for further expansion, and in 1955 the Chapel and associated rooms was dedicated. In 1967, the congregation broke ground for yet another expansion, the Christian Education building. It too, was dedicated a year later and housed the Sunday School as well as a new mission of the church: The Weekday Nursery School. Along with this addition, a contribution by an anonymous donor led to the design of the Cloister Garden which completed the facility as we know it today. A common thread throughout the history is MISSION. By the time the third pastor was installed in 1883, his salary was $2,500 while $3,000 went for benevolences! Throughout Garner Morgan’s “A Brief History” one reads of large hearts and caring souls at Central who have taken care of others whenever possible.